2015 has come to an end, and that means I get to look back on my New Year's Resolutions to see how I did. Number one this year was to "stay happy" and I certainly did that. 2015 saw me say, "enough is enough" in my role as a software developer and so I found myself a new job - as a software manager. Now, when Lara asks me what I do for a living, I can't really say that I write code.. I now tell her that I help people write great software! And interestingly enough, Lara seems to understand my new role description more than she did before! In 2015 Lara herself has learned to code and in 2016 the government are encouraging parents to learn a little coding skill too so that they can support their children at school. All school children from year one onwards now learn the very basics of how to author code and this makes me very happy. When I was at school, computing just about stretched to a knowledge of how to use a word processor. Lara on the other hand, is 6, and claims to know how to write a "for loop". This is progress. And I'm immensely proud of her. The UK government know that we can't bring up a generation of software engineers without the support of their parents and so they're encouraging parents, as well as children to try out an Hour of Code in 2016 as a New Year's resolution to support their children's coding skills. The premise is that, with just an hour of learning, you can grasp the basic concepts needed to write your first algorithms. 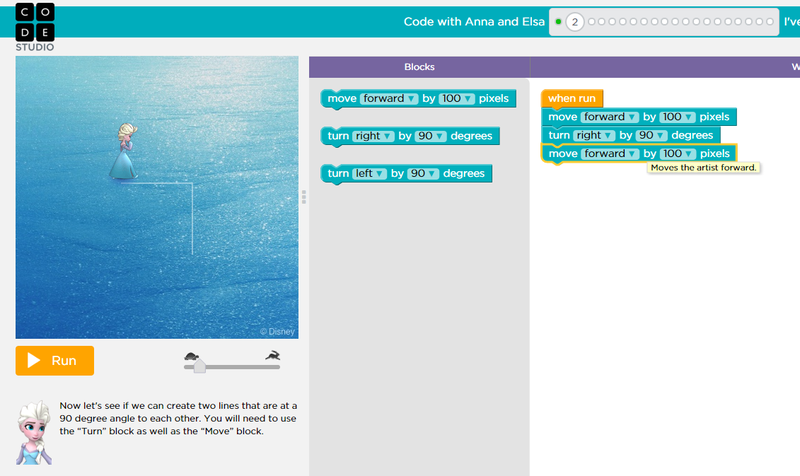 The Hour of Code website has links to several learning resources for adults and children of lots of different ages. The VERY first thing we set up on Lara's new computer this Christmas was a link to the Disney Frozen Hour of Code website in which Elsa and Anna help you to put together loops and extract code into methods. I'm genuinely impressed by this website and it is certainly challenging, but encouraging for children of Lara's age. Our favourite Hour of Code that we have tried so far has to be Lightbot which is available on the web, or as an app for your tablet. Lightbot requires you to program in commands to control a little robot who must switch on lights at specific times. As you progress through your hour you learn how to repeat blocks of commands, and then how to extract groups into procedures that can be re-executed on demand. By the end of the hour, Lara struggles but she sticks with it and feels very proud each time she completes a level. I don't think that the concepts have stuck yet, but with enough practice it'll become second nature to her! The Hour of Code website has lots of ideas of how to support your child through their hour of code and different activities that appeal to lots of different tastes. If you fancy going beyond one hour then there ideas of how to take further steps into learning to code; whether that is learning to write your own apps and games, or starting to program your own website. So, if you'd like to learn some basics to support your child on their software development journey then why not resolve to complete your own Hour of Code in 2016?